For those of you that haven’t met our Hair Designer let me introduce you to Jessica. Texture Cutting with Anne Veck- Skills on cutting techniques to create texture and movement in your hair style. Advanced Cutting with Ashleigh Hodges- Celebrity Stylist Ashley visited the salon to demonstrate current trends and how to create them. Balayage Colouring with Steven Housley- Matrix Educator Steve visited the salon for this practical workshop where Jess and the rest of Team Caprio’s produced beautiful Balayage colours using various different and bespoke colouring techniques. Hair-Up– This workshop helped Jess to expand her special occasion styling techniques to perfect the art of dressing long hair in various different ways and release her inner creativity. 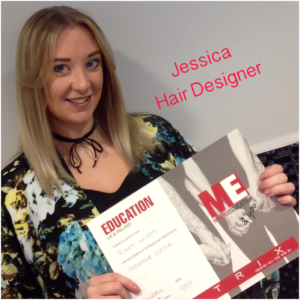 Jess has given up a lot of her own time to attend some of these courses and workshops which proves she is passionate and dedicated to becoming the best Stylist she can be. Expanding her skills and expertise is important to her, your hair is important to you which is why you can be assured your much loved locks will be in safe hands when you book in with Jess. She cares about the condition of your hair so will be ready to recommend the correct home hair care products to make sure you get the most out of your colour and style once leaving the salon. She’s qualified in all aspects of hairdressing as you can see from the list above but just as importantly she’s a very friendly approachable team member with a great sense of humor. In fact you can read our Customer reviews for yourself and see what they say about Jess and the rest of team Caprio’s. Every Client is sent an invitation to rate the individual Stylists, the team and the salon following the service they’ve received. CLICK HERE to read them for yourself. Booking in with Jess has never been easier……….if it’s a colour you want to book then please call the salon on 01384402890 and speak to one of the team who will book you in for a Skin Test and Colour Consultation with Jess OR…..to book a Reshape & Finish and/or Colour Consultation CLICK HERE.